Sometimes it’s hard to recognize that something simple, even humble, can be a marker of profound healing. Now that I live farther “out” from downtown, the walk in and back is probably almost two miles. In the winter weather, Romeo and I suit up, and I usually wear my backpack, especially if we’re going downtown to do errands. It starts out rather empty, but it’s never completely empty. It always has my checkbook, my wallet, my glasses, my list (hopefully), dog poop bags, and often there’s extra bags and containers for shopping in bulk. Or a package I have to drop off at the post office, or a book that needs to go back to the library. Plus there’s the coats, the headbands, the gloves, and when it’s icy, the ice cleats. . .sometimes it feels like we’ll never get out of the house. But we always do. And when we’re clipping along toward Washington Street, the cool air on my face, I’m glad we’re outside, no matter the weather. As we turn onto Washington for the walk into town, several times I have stopped cold, certain I’ve forgotten my backpack. A flurry of worry crosses my mind. I lift my arms to feel the shoulder straps. They are there. It’s all there. Then a wave of confusion. How could I not know my backpack is on? Finally, after a third or fourth time of this, my monkey mind let the sun of a new thought shine through: I am so much stronger that I don’t even feel it on me anymore, unless it is laden with groceries. It’s hard to explain the significance of this. I’m now walking more than twice as far and back to get downtown. Unless there is ice, Romeo and I frequently walk up the big Jefferson Street hill to get to the library, something I thought I would always have to avoid. And years and years ago, before starting to eat this way, I was so weak I could feel even a heavy necklace pull my head down and tire me out. I always could feel my backpack, the minute I put it on. I wore it, and I used it, but it weighed me down, and later I would need to recover just from having it on me. There are times, still, when it’s so full of groceries that I ask the grocery clerk to hold it up for me so I can put it on, since it’s easier to slough off when it’s heavy than it is to lift it onto my back. And it saves my arms for anything else that may come up on the walk home. Like Romeo needing to do his business. Often though, even then, I’ve forgotten I’m carrying a heavy pack until I bend over to pick up the business and it slides a little out of place. That used to be call for big concern and alarm, since it might knock me right off my balance and onto the ground. But it doesn’t anymore. And if need be, I can always touch base with Romeo’s back as he waits while I right myself again. Like a friend who had a career advocating for people with disabilities once said to me over a decade ago when she was helping me fill out a form for Social Security, ability is effortless, automatic. You don’t have to think about it or try to do it. My body work therapist had told me the same thing. This was news to me. Living a life from the beginning with mild CP had always meant conscious attention to succeed at walking, balancing, climbing stairs, turning around–apparently things other people didn’t have to think about at all to do. So I know these seemingly small changes are huge, and I’m happy about them. But first I had to get over the shock of what I’m experiencing, since it’s so different from what I conditioned myself to expect years ago. It’s like recognizing the porcupine in an amazing photo a Moscow friend took. 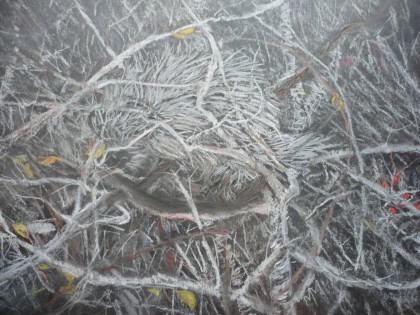 It took me a minute to see him, but there he was: a magnificent porcupine “hiding” in a network of bare branches. I was so enchanted with him I spent weeks trying to draw him in this natural hideout. We are so bombarded with spectacle in our world that sometimes it’s really hard to see the porcupine. So in honor of the simple earthy beauty of his natural habitat and the simple “automatic” experiences that point to complex healing processes, I’d like to share with you a simple, earthy way to eat your oatmeal. As those of you who follow my blog regularly know, I am notorious for eating a big breakfast. So I confess, this is often my “second course” after a Decadent Pomegranate and Kale Breakfast Salad–almost always without the pomegranates and the jam in the banana carob dressing. I use whatever fruit I might have on hand and add cooked quinoa instead of buckwheaties. It’s currently my favorite way to eat breakfast. This oatmeal has started to follow that breakfast salad in the cooler weather, and as our walks got longer or the day contains things that will require some stamina and a long wait for lunch. It’s simple, whole food, made sweet without sugar. I eat it just like this, without any spices or added almond milk. You can dress it up further if you like. I only ask that you taste it this way first. You can use any tea you like, but kukicha, or twig tea, is my go-to choice. It’s a Japanese “green” tea that isn’t really green, because it’s made with the twigs from the tea plant. It’s what peasants used to drink, since it was mostly what was left over after the tea leaves were harvested; hence it’s earthy taste and very low caffeine content (1 or 2 percent I think). Now it’s touted for a myriad of health benefits and is no longer considered the leftovers. It can seem pricey. A very dear friend of mine (who shall not be named but might be reading this) thought the big bag I bought on Amazon was too expensive for her. But there are many varieties of it in tea bags, too, you can buy on the shelf in any co-op or Whole Foods (or different brands of “loose twig” in smaller sized bags on Amazon, I just went with the high quality brand my dear herbalist friend drinks). They don’t run any more expensive than any other specialty tea, and so I ask you: is a big bag of high quality organic twigs that costs about 7 times more than a box of prepared tea but is way more tea in actual use a pretty good deal, when it will last you a very long time? Try a smaller less expensive one to start with if you want, but if you end up loving twig tea like I do, I rest my case. 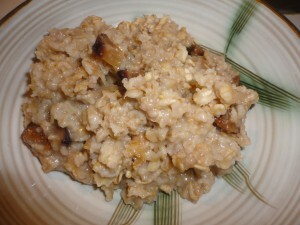 Spicy chai type tea or good earth tea might also be a good choice for this oatmeal. But I’m sticking with my twigs for now. 1 dried black mission fig, cut in small pieces. Put everything in a small saucepan (I use a “green” non-stick one) and turn the heat to low. Walk away and check your e-mail, eat your kale breakfast salad or take a shower and get dressed for work. Read the paper. Wrap some Christmas presents. You choose. 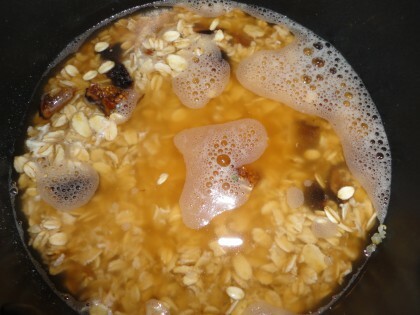 The aim is to let the oatmeal cook uncovered until it has absorbed all the liquid and maybe even developed a light brown skin on the bottom. Spoon out and enjoy. I really don’t know how long it takes because I always put it on and go do things, and then when it looks like it’s done enough, I eat it. To be honest, I found out it’s really good this way by forgetting about it and coming back to see that it looked almost like it had baked and that the whole of it was infused with the flavor of the carmelized fig and the tea. Simple. And absolutely delicious. Here’s to peering through the branches and finding a lovely and living surprise. To seeing the porcupine in your own healing. And to twigs that can be healing tea. This sounds delicious! And I have everything on hand (well, not twig tea, but chai, for starters). I’m a huge fan of your pomegranate kale breakfast, and I make that all the time. I can’t wait to try this one. Thanks, Maria! Well, I’ve made it several ways, and it’s all good! I’ve tried twig tea, decaf chai, and decaf green tea. I use calimyrna figs. I especially appreciate that you mention using leftover tea. it seemed odd, but then I realized how often I have leftover tea! Now I pop the leftover tea in a jar and store it in the fridge until I need it the next day! Thanks for another great idea for breakfast. Maria, your words are always pure poetry – and just what I need to hear at the exact same time! How wonderful that your healthy diet has made such profound changes in how you feel & your everyday life. I am thrilled for you! Thank you for the simple, unique & delicious-sounding oatmeal recipe. I will track down the twigs tea, & happily give it a try. Wow, who could have thought THAT was expensive? LOL Honestly, I’m not a big fan of earthy flavors in my tea, but you’ve convinced me to try it if I ever see an individual bag of twig tea (or a really low priced box). Until that time, I will try your recipe using chai tea. In fact, it will be breakfast tomorrow. Beautiful writing, as always, and it’s so inspiring to hear how much healing this way of eating has brought you. Merry Christmas! Your recipes are so interesting too. I love oatmeal but am unsure about twigs! I enjoy green tea though. So glad to hear you are slowly strengthening, it can only be good for you. Battling through exercise is showing results with me, my small victory! I had a rare outing to the shops and I got round 5 streets without sitting anywhere! I hurt alright but I was thrilled for I have the proof too that it pays off.